One of the fascinating things in Scottish salmon fishing is getting a close up look at these amazing creatures before setting them free. All salmon are individuals and even if from the same shoal as they all have their own individual markings and shape variances. Take a minute to watch this moving carousel of salmon individuality brilliance. The thrill of catching one of these perfect creations is indeed amazing however the tact, skill and patience levels required should never be underestimated. A perfect creation like a wild Atlantic salmon is a completely different proposition from a stocked rainbow trout so anyone looking for instant gratification in this sport is usually in for a rude awakening! If you're struggling for success in this pursuit or are looking for an introduction then get with a professional salmon fishing guide who's got a good track record for success. This will get you off the starting block quickly and effectively and save much frustration. From what I've personally witnessed over the decades there's been a colossal wastage of anglers who have initially entered this sport on a 'permit only' approach which is a real false economy. These anglers who were initially interested enough to purchase that permit (and probably all the required salmon fishing kit too) missed out on the most important entry level component of all which is a professional guide to show them how to 'effectively' fish for salmon and gain true value from their salmon fishing permit and fishing equipment outlays. Make no mistake about the fact that turning up with even the most expensive kit isn't going to be effective for catching a wild salmon without the vital fishing skills. I often wonder what the Scottish river catch numbers would look like if a crack team of seasoned professionals were deployed on each salmon beat of every Scottish river on each fishing days of the season. I've have little doubt that this would at least quadruple the salmon catch numbers that everyone is so tuned into these days. The reality is that often no salmon anglers turn up to fish a beat at all or whoever does turn up to fish isn't experienced or good enough to notch up a fish for the beat's record book. There's also a colossal difference for success in this game between being able to throw a nice line and being able to fish effectively so don't let that one fool you either! For success in this business to acquire you a close up inspection of one of these fine creatures you need to know how to use your fly rod properly and ideally with both hands to give you the versatility to be able to confidently fish from either side of the river in any wind condition. You must also know how to space each swing of the salmon fly correctly for maximising your chance of a predatory reaction from a fish that isn't in the river to feed. The big one that I see that would at least double the Scottish salmon catch records overnight is knowing how to set the hook properly when that hard earned take eventually appears. 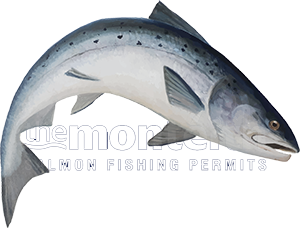 Thousands of salmon are lost each year by anglers not dealing with the salmon take effectively which is a polar opposite from what's required in the trout fishing world. Take the time to introduce yourself properly to this amazing pursuit and stay in this magnificent game for life!